A large Magazine Street building heavily damaged in a fire earlier this year has been approved for demolition, but neighbors and City Council members say they intend to remain involved in the rebuilding plans against any large, “big box” style developments in its place. Meanwhile, a separate request to tear down part of a historic home just off the Freret corridor for a driveway split the City Council and failed amid concerns that the character of the streetscape might be altered for the purposes of an investment property. 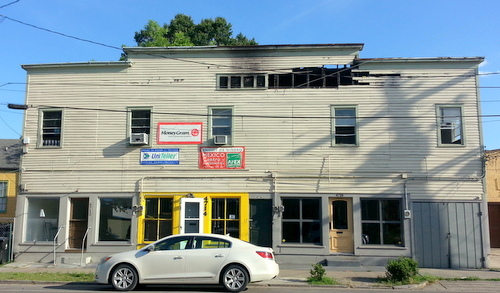 The building at 4712 Magazine Street caught fire in January after a kitchen fire in an upstairs apartment spread into the attic, damaging the other apartment and the three businesses below. On Thursday, City Councilwoman LaToya Cantrell said that the owners want to rebuild a similar configuration, with several residential units upstairs and commercial on the ground floor. That plan drew a praise from Councilwoman Stacy Head in theory, but concern about how it will develop in practice. “My main concern is the preservation of small mom-and-pop spaces,” Head said. “Several bays downstairs and residences upstairs sounds wonderful, but what assurances do we have that it’s not going to be big-box retail? The motion to allow the demolition includes the legal restraint that the redevelopment plans must be submitted to the Department of Safety and Permits before the demolition can begin, Cantrell explained. In the meantime, she said, she is working with the building owners, architects and neighbors to get a design that is in keeping with the character of Magazine Street. “The demolition be subject to providing the building plans to Safety and Permits, as aligned with the requirements of the City Planning Commission,” Cantrell said. Meanwhile, those plans will also have to conform to the Magazine Street overlay, which is one of the “most restrictive” areas in the Comprehensive Zoning Ordinance, said Stephen Kroll of the City Planning Commission. While the planning commission can’t guarantee that the sizes of the sales floors will stay exactly the same, they will require “something consistent with architectural rhythms of the corridor,” he said. Three neighbors spoke to the demolition along similar lines. They aren’t opposed to the demolition, they said, or to the property’s re-use in a similar mixed manner to what preceded the fire. They simply want to make sure the new project is not so much larger or more invasive that it harms their quality of life. “It is a high stakes project for many people in a tight residential community,” said Andrea Neighbors of Valence Street. The assurances by Cantrell and the City Planning staff assuaged Head’s concerns — “That’s given me more confidence that we will end up with a good product,” she said. Cantrell’s motion to allow the demolition passed unanimously. In a separate demolition request, however, the Council narrowly rejected a request to demolish one of the four bays at 2528 Upperline Street to allow the addition of a second floor and a driveway. Cantrell introduced the request by noting the pattern of off-street parking in the surrounding neighborhood, as well as letters of support from immediate neighbors. “If this was new construction, they would be required to allow for off-street parking,” Cantrell said. The request was met with immediate disagreement from Councilwoman Susan Guidry, who said the specific design of the house contributes to the neighborhood. Destroying historic buildings for off-street parking sets a bad precedent, she said. Guidry’s point was echoed by Erin Holmes of the Preservation Resource Center. The owner, Scott Taranto, said the demolition would only remove a quarter of the front facade, and said that the parking would be for him and his wife, who are considering moving to the house from their home on the Westbank. While she praised Taranto personally for his “wonderful work” on other projects, Head said that allowing this kind of alteration would not only damage the historic character of the neighborhood, but also dramatically contribute to rising home prices. Williams concurred with Guidry and Head that the demolition could set an unfortunate precedent. 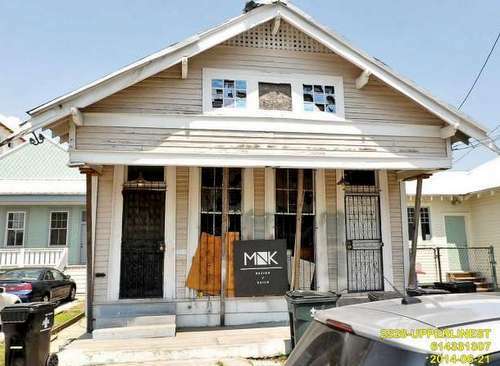 “We wind up with a bunch of houses that don’t look like New Orleans houses,” Williams said. The Council voted 3-3 on Cantrell’s motion to allow the demolition, killing it for lack of a majority. In 1875, that house was wilderness. It couldn’t have been built before the end of the First World War. That area was being built up between 1845 and 1910. That house appears to have been built between 1885 and 1900. My apologies with the 1875 designation. Tulane U and the town of Jefferson were being developed in that area, then later annexed to New Orleans. That lot definitely was in the development area prior to the Civil war. Does anyone know what’s going on with the Danny’s wing place directly across the street from this place? On the lake side of Magazine on the corner of Valence? That has been closed and idle forever. Prime space for a legitimate business to head to. Curious why it continues to remain a blighted attraction for loitering. Mr. Nguyen of Houston owns that property plus the convenience store and shuttered pawn shop in that block. He lives in Houston and checked his “giveadamn” at the state line. In negotiating with him 13 years ago, I found him to be entirely unreasonable. I believe the only thing that will push him into action is municipal fines.